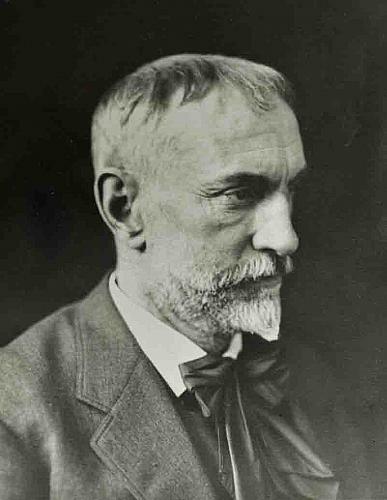 David Wolcott Kendall, one of the early school of designers, was born October 11, 1851. He was a student, a musician, wood carver, artist and inventor. He came to Grand Rapids from Indianapolis in 1877. As a designer he served the William A. Berkey Furniture Company, the Phoenix Furniture Company and Berkey & Gay. His business sagacity and acumen became evident, and eventually he was made general manager of the Phoenix. Mr. Kendall is given credit for the development of antique oak, the sixteenth century, the canary, the cremona, and the malachite finishes, and many other features commonly employed in the modern method of furniture construction. He died February 16, 1910, in Mexico City, while on a tour of inspection and study of architecture and ornament of the prehistoric Incas, Toltec, and Mayan tribes of Yucatan and Central America. He also went to Egypt to study Egyptian ornament and hieroglyphics. Shortly before his death in Mexico he sent a rough pencil sketch of a settee to the factory, which was carefully detailed by William Balbach, his chief assistant. Berkey & Gay Furniture Co. Phoenix Furniture Co.
Berkey & Gay Furniture Co.
Coll. 204-7, History & Special Collections Dept. Reproduction and copyright information regarding this image is available from Grand Rapids History & Special Collections, Archives, Grand Rapids Public Library, Grand Rapids, MI. Charles H. Radcliffe, Designer, Nelson-Matter Furniture Co.